Tech leaders are a huge % of this number, in the last quarter they bought back vast amounts of stock. These activities are thought to support stock market values. 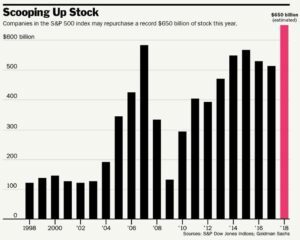 2007 is the year still holding record for stock buyback levels. Stock buyback in 2007 were a reason people said the market would remain going up. 2007 is also infamous as the predecessor year of the 2008 crush and following “great recession”.